Remote sensing helps scientists monitor coral reefs. Various parameters can be measured including temperature, turbidity, chorophyll a, wave height and ocean currents. By monitoring these levels over time, predictions can be made on threats to reef areas like coral stress and coral bleaching. 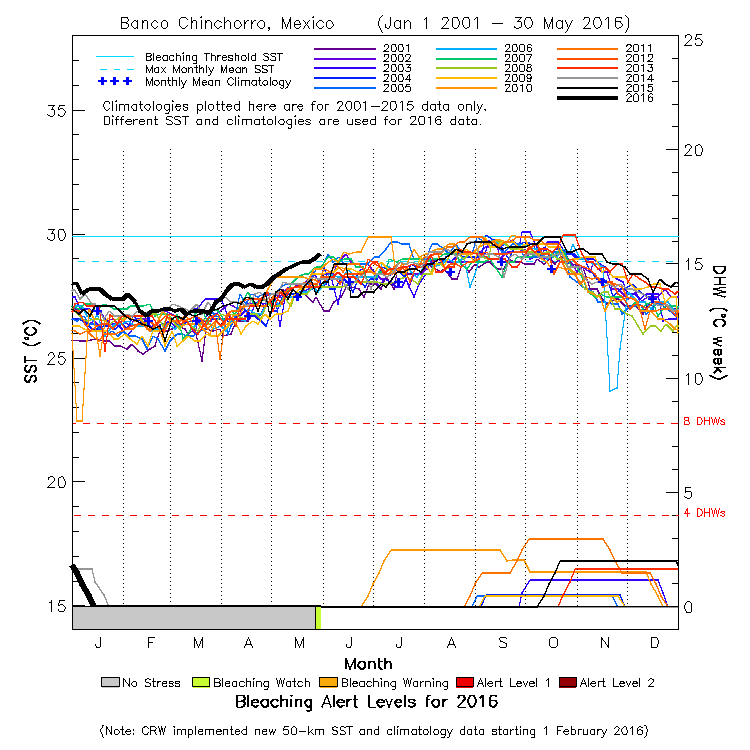 NOAA has several virtual products that help predict levels of stress and coral bleaching. The area in Belize is under a Watch for the period Jun - Sep 2016. Available for each virtual site. There is one in southern Belize at Glover's Atoll and one in Chinchorro Atoll, in southern Mexico. In previous years biologists have noticed differences in bleaching levels between northern and southern Belize so both sites are monitored. NASA Worldview is a product that provides a recent image of the Earth. Useful for monitoring turbidity along coastlines, or cloudcover. 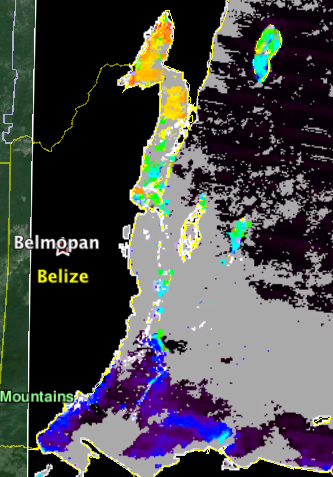 Imagery from Oct 5, 2014 confirms area of turbidity along the Belize Barrier Reef between St George's Caye and Goff's Caye. The product is also available in Google Earth. 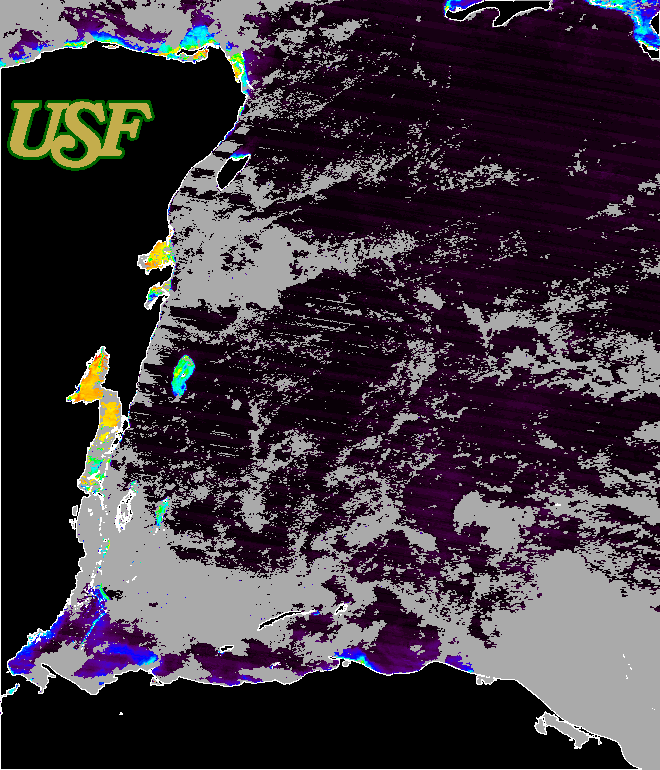 The University of South Florida compiles MODIS (Moderate Resolution Imaging Spectroradiometer) products for Belize. These satellite images can be compared to ground truthed data and personal observations, and to the imagery available in NASA Worldview above. The maps are not 100% accurate but do provide information on a large scale. Chlorophyl levels for Belize Oct 5, 2014. In Google Earth you can zoom in and observe the extent of distribution of chorophyl a. Note: Special thanks to Emil Cherrington and the Belize Group on Earth Observations & GIS for providing links used to prepare this page!